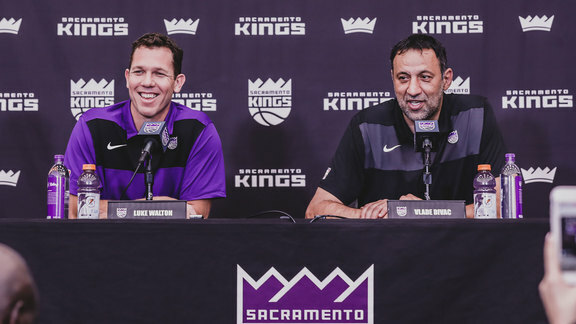 Sacramento, CA – Today, the Naismith Memorial Basketball Hall of Fame announced that Sacramento Kings General Manager Vlade Divac has been elected as part of the 12-member class of 2019. Divac becomes the 15th player in franchise history and the second during the Sacramento-era to earn a Hall of Fame induction. Divac, currently in his fourth season as the General Manager of the Kings, is one of the most respected and revered individuals in franchise history. Prior to joining the Kings front office, Divac spent more than a decade serving the NBA and international sporting communities with the same distinction that solidified his reputation as a consummate teammate, player, humanitarian and overall difference-maker on and off the basketball court. His NBA career spanned 16 seasons with the Los Angeles Lakers (1989-90 – 1995-96, 2004-05), Charlotte Hornets (1996-97 – 1997-98) and Sacramento Kings (1998-99 – 2003-04). His jersey was retired by the Kings in 2009 and hangs in the rafters at Golden 1 Center. Prior to joining the NBA, Divac began his professional career in 1986 with Belgrade-based club KK Partizan and would go on to be a key member of his country’s national team that took home multiple EuroBasket gold medals in 1989, 1991 and 1995. In the FIBA World Championship, he helped lead his teams to gold in 1990 and 2002. He earned a silver medal in the 1988 Olympics with the Yugoslavian national team and took home another Olympic silver with the Serbian national team in 1996. In 1991, Divac was named among FIBA’s 50 Greatest Players and in 2008 was named among the 50 Greatest EuroLeague Contributors. In 2010, he was inducted into the FIBA Hall of Fame in recognition of his play in international competition. Divac joined the NBA in 1989 when he was drafted 26th overall by the Los Angeles Lakers, earning 1989-90 NBA All-Rookie First Team honors, helping pave the way for European players to enter and contribute to the league. In 1996 he was traded by the Lakers to the Hornets for Kobe Bryant and spent two seasons in Charlotte before signing as a free agent with the Sacramento Kings in 1998. The 2001 NBA All-Star has been recognized for his contributions to the Kings in the 2000s and for redefining the role of the modern NBA center. Known for his craftiness on the court and generosity off the court, he would go on to make indelible marks on the franchise. During his tenure, Divac helped the Kings reach the NBA Playoffs in six straight seasons (1998-99 – 2003-04) while capturing two back-to-back Pacific Division titles (2001-02, 2002-03), a franchise record 61 regular season wins in 2001-02 and a trip to the Western Conference Finals. 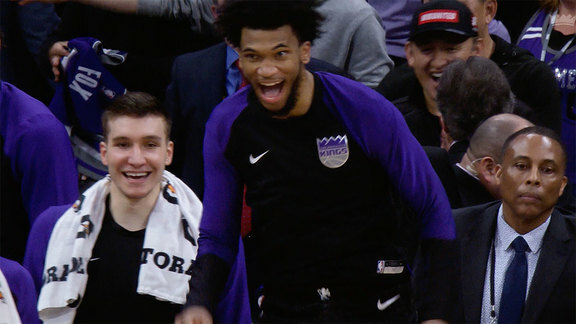 His name adorns the franchise record book in several key categories during the Sacramento-era, including ranking third in rebounds (3,538), fourth in blocked shots (523), sixth in assists (1,693), eighth in both steals (453) and games played (454), and ninth in both points scored (5,176) and free throws made (1,209). In 2004, Divac signed as a free agent with the Lakers and played his final NBA season. Divac is the first foreign-born and foreign-trained player ever to play more than 1,000 games for the NBA. He is one of just seven players in the history of the NBA to record more than 13,000 points, 9,000 rebounds, 3,000 assists and 1,500 blocks, joining Hall of Famers Kareem Abdul-Jabbar, Shaquille O’Neal and Hakeem Olajuwon, along with Tim Duncan, Kevin Garnett and Pau Gasol. Over the course of his NBA career he averaged 11.8 points (.495 FG%, .235 3pt%, .692 FT%), 8.2 rebounds, 3.1 assists and 1.4 blocks per game in 1,134 contests. Divac has been a global ambassador of the game, using basketball as a platform to bring people together. In 2001, Divac helped to start the first-ever Basketball Without Borders (BWB) camp in Europe when he reunited with former teammates from the Yugoslavian national team to work with 50 children from Bosnia and Herzegovina, Croatia, Macedonia, Slovenia, Serbia and Montenegro in Treviso, Italy. More than 15 years after his first camp, he returned to Serbia last summer to participate in the 17th and first-ever BWB in his home country. Since its inception, BWB has reached more than 3,200 participants from 127 countries and territories, with more than 55 former campers drafted into the NBA or signed as free agents. From 2009 to 2017, Divac served as the President of the Serbian Olympic Committee and was named to the Olympic Order for his services to the Olympic movement in 2016. In 2000, Divac became the first foreign-born winner of the NBA’s J. Walter Kennedy Citizenship Award, recognizing his service and dedication to the community. Together with his wife Ana, Divac founded the Ana and Vlade Divac Foundation in 2007 to help refugees address housing needs, raising over $20 million and securing assistance for over 700,000 people. The Foundation is a continuation of their 30 years of humanitarian work, which began in the US with the Humanitarian Organization Divac. Divac is joined in the Class of 2019 by Bobby Jones, Bill Fitch, Sidney Moncrief, Jack Sikma, Paul Westphal, the Tennessee A&I teams of 1957-59, Teresa Weatherspoon, Al Attles, Charles “Chuck” Cooper, Carl Braun and the Wayland Baptist University teams of 1948-82. Enshrinement festivities are scheduled to take place on Saturday, September 7 in Springfield, Massachusetts.